Today's post is dedicated to the wonderous invention that is dry shampoo. I have always wanted to love it in the way I know others do but I don't know whether it was that I was always applying it wrong or not picking one suitable for my hair but I just could not make it work for me in the way it should be. 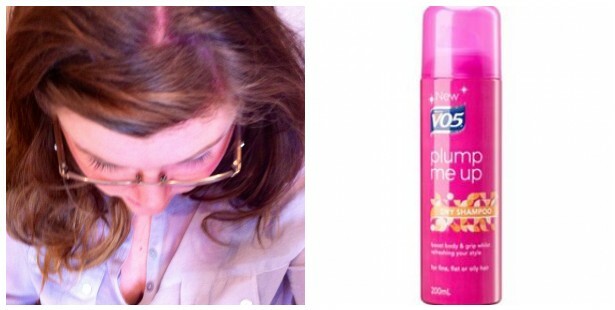 I either looked like I had a muddy scalp (Batiste Brunette I am talking about you) or had a Cruella De Ville style grey streak.. until I decided to try VO5's new addition to their collection - Plump Me Up Dry Shampoo. It smells absolutely divine, very clean but not overwhelming and the shampoo part is such a finely milled powder that you don't get the aforementioned grey coverage from it. I should probably wash my hair everyday as it tends to get greasy but with the ombre dyeing of the ends it has become very dry, particularly on the blonde section so I try not to wash it too much anymore.. hence my keenness to find a dry shampoo that suits my hair! This is perfect and very much does what it says on the can.. it completely rejuvenates hair and soaks up the beginnings of grease or even can be used to build volume after washing. I put it on at night, rub it in and then it soaks up nicely over night. I am really very impressed with it and will most definitely will continue to purchase. I paid a bargainous £3.50 for quite a big bottle which is cheaper than Batiste and a similar size if not bigger! My hair tends to get greasy and lank so this might be a good product for me!